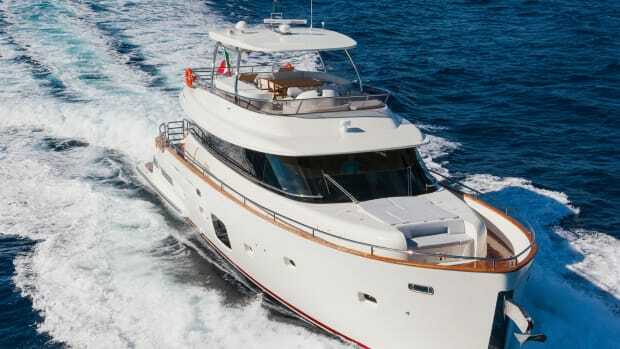 Capacious and comfortable, Hargrave&apos;s 76 Flush Deck Motor Yacht is in it for the long haul. Captain Don Pokornoy stood at the helm, eyed the sedan-bridge yacht in our path and considered the options. He looked like a billiards champion trying to line up his next three pocket shots in a row: Yes, we were penned in at the dock, blocked by the bow of that sedan bridge, and even if we could get around, we’d still be in a mess of traffic. It was the day after the Palm Beach International Boat Show, with hundreds of boats trying to untie as temporary docks came down. Think Memorial Day or Fourth of July, only with the quarters being even closer. 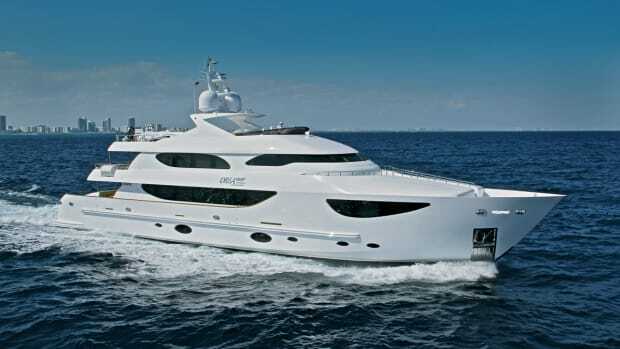 Pokornoy eased the throttles on our ride, Quiet Sun—hull number two of the Hargrave 76 Flush Deck Motor Yacht—and wriggled us free with the bow thruster, showing off the new build’s maneuverability. He then put Quiet Sun to a different test, queuing along the Intracoastal Waterway and waiting with everyone else for the next bridge opening. 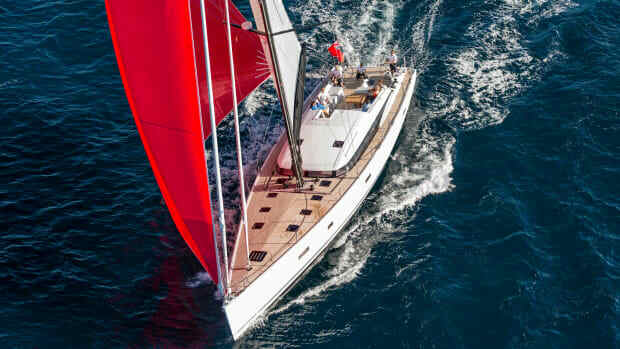 Finally, Pokornoy maneuvered her through Palm Beach Inlet and into open water, and then opened her up to a fast cruise of 20 knots in 1- to 2-foot seas. The ride felt all the more exhilarating given what it had taken for us to get there, and the fresh salt air reminded me why so many people cram into boat shows looking for a great build in the first place. He’s referring to Pacific Northwest naval architect Jack W. Sarin, whose efficient, seaworthy hull designs have been the favorites of cruising yachtsmen for years. During our sea trial, Sarin’s semi-displacement hull form with knife-like entry indeed gave us a smooth, stable ride—albeit in admittedly calm conditions. 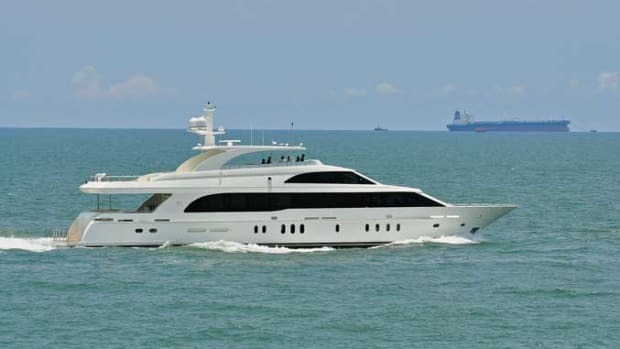 Hull number one, which premiered in late 2013, had full walkaround side decks so a captain or crew could get aft quickly from the lower helm station, but when that yacht toured the boat show circuit, Hargrave heard requests for more interior space. 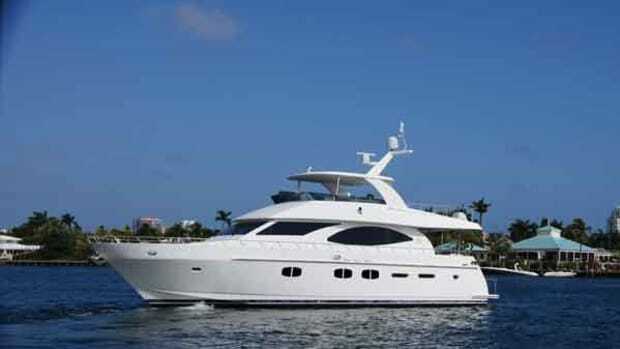 Owners said they were spending more time living aboard than cruising. As a result, Quiet Sun is a wide-body version that eliminates the walkarounds, gaining 18 inches of main-deck space and corresponding volume. The yacht’s interior design takes styling cues from the Hargrave 125 Raised Pilothouse, which DiCondina describes as a “design breakthrough yacht” for the builder. Adding to the spacious feel on the main deck is the fact that Quiet Sun has no formal dining area in the salon. Instead, a dinette is in the country kitchen-style galley forward, and outdoor dining tables are on the aft and flybridge decks. Because the salon is wide open, guests who enter from the aft door get an immediate impression of luxurious living space. The yacht’s flush-deck construction also affords an uninterrupted view all the way to the windshield, further enhancing the feeling of openness. 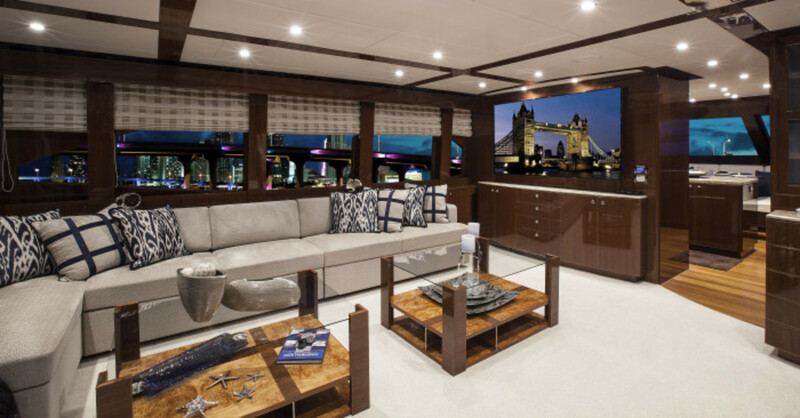 Big windows and custom-made, apartment-style furniture give this liveaboard motoryacht the feel of an upscale home. Quiet Sun’s interior décor is classic yet fresh in feel, with gloss walnut woodwork, ash burl wood, and walnut and teak accents. 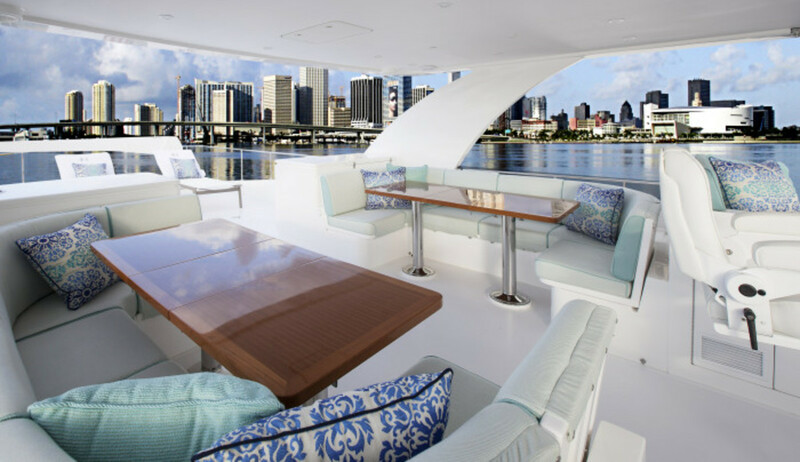 The wide-body configuration gave designer Shelley DiCondina (who is married to Mike) of Yacht Interiors by Shelley more space to add salon seating, including two freestanding armchairs. Hargrave also eliminated the lower helm station on Quiet Sun, opening more floor space in the galley to allow for a larger granite-topped island work counter. The forward dinette was expanded by 25 percent. Add two stools, and it will seat seven or eight guests. Quiet Sun’s belowdecks accommodations include three suites in a footprint where Hargrave easily might have squeezed four smaller staterooms. Both the full-beam master and forward VIP have king-size berths, while the port guest stateroom has twin berths that convert to a queen. 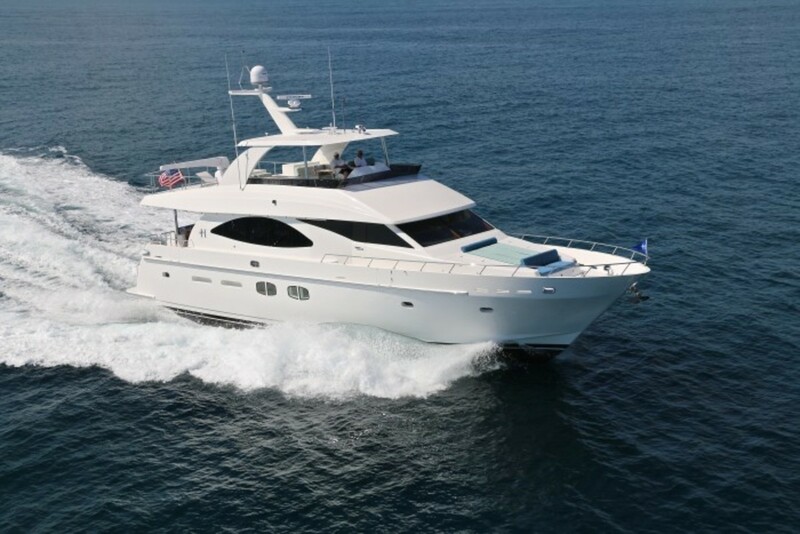 Depending on owner preference, the 76 can accommodate two additional guests or crew in a fourth stateroom that is aft, accessed via the transom door. That space also has twin berths that convert to a queen, plus a Pullman and a head with shower. 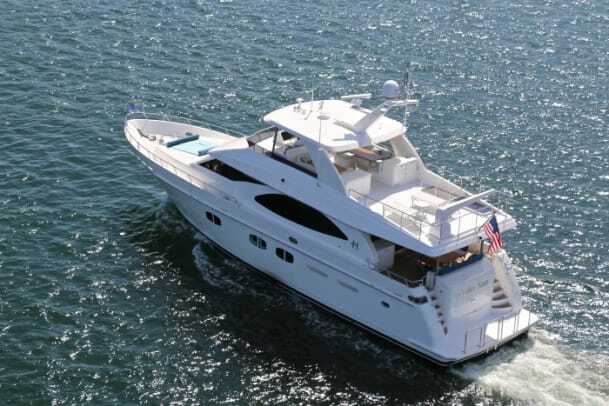 “The fourth cabin is ideal for guests who want some privacy as well as occasional or permanent crew,” Mike DiCondina said. Both the original and wide-body versions of the Hargrave 76 have serious headroom and stowage. A professional basketball player would feel at home, even in the engine room, where the headliner is more than 8 feet above the sole. Hargrave also added stowage in every nook and cranny that wasn’t already being used. A good example is the lower-deck companionway, which is lined with three closets—two for linens and one with a stacking washer/dryer. Open-air living space is impressive on Quiet Sun as well. Two sets of transom stairs lead up from the swim platform, and there’s enough space between them on the aft deck for a dining table that seats eight. 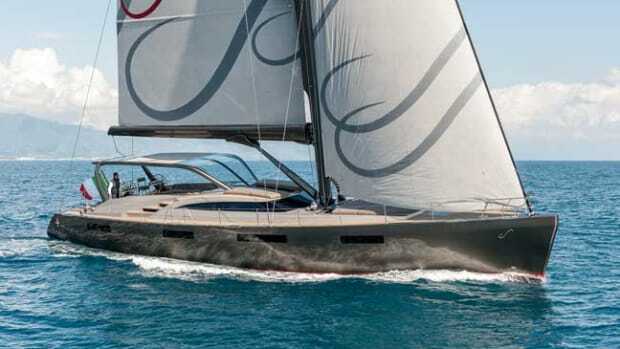 The foredeck also has a large area for lounging or sunbathing. Open-air living space is impressive on Quiet Sun as well. Throw in the 20-knot cruise speed, and you have a versatile vessel to transport those 16 people to a quiet cove and get the party started even sooner. Heck, leave right from the boat show. 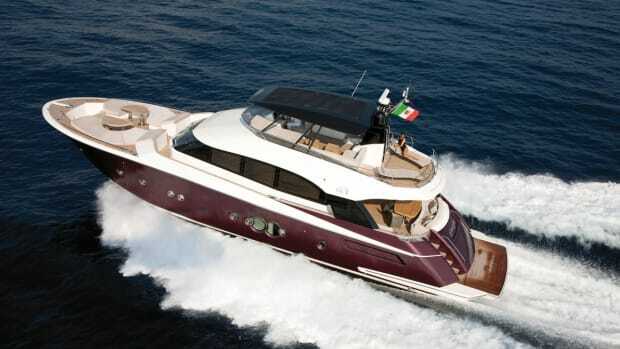 The Hargrave 76 Flush Deck Motor Yacht is ready whenever you are.